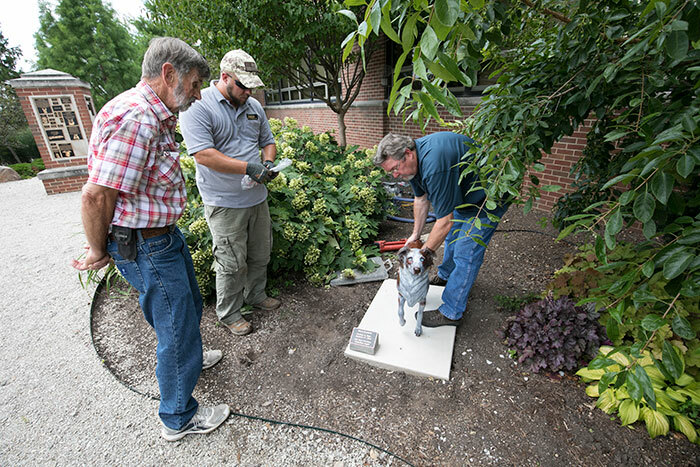 The memory of a beloved dog lives-on today in the form of a beautiful new sculpture placed on the Lynn Hall grounds near the entrance to Purdue Veterinary Medicine's Small Animal Hospital this summer. Dixie was the companion of a very caring couple who relied on the Veterinary Teaching Hospital for help when their dog needed medical care. Mark and Gwen Goodwin have always loved animals, especially their Dixie — an Australian Shepherd with the most gorgeous blue eyes. She grew up on the Goodwin's farm in Bloomington, Ind. Along with the Goodwin's three children and nine grandchildren, Dixie was a beloved member of the family. When she became ill, the Goodwin's brought her to PVM's Veterinary Teaching Hospital for treatment. Dixie's veterinary medical team did everything they could, working tirelessly to keep her around a little while longer, but Mark and Gwen lost their precious companion in January 2016. 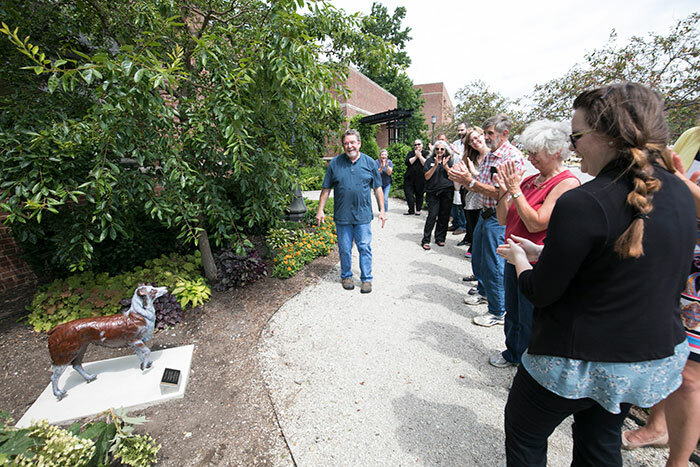 In memory of their pet, the Goodwin family chose to pay tribute with a bronze statue of Dixie that was installed July 7 in the Dolores McCall Pet Tribute Garden just south of the Small Animal Hospital entrance. The sculpture is the work of Rita Hadley, who owns Moments in Bronze in Otterbein, Ind., together with her husband and fellow sculptor, Rick. Both were on-hand to supervise the installation, working with Chris Young from the Purdue Mason Shop. The Goodwin's watched, joined by the clinicians and technicians who became so close to them and Dixie during Dixie's treatment. A small reception was held following the dedication, giving Mark and Gwen a chance to reconnect with the team that cared for Dixie during her time at the Small Animal Hospital. The Dolores McCall Pet Tribute Garden was established as a class gift project by the College's DVM Class of 1972. Designed to provide a peaceful walkway of reflection surrounded by trees, plants and boulders, the garden includes a brick monument containing personalized bronze plaques commemorating beloved pets. Additionally, there are several life-size bronze statues of pets. 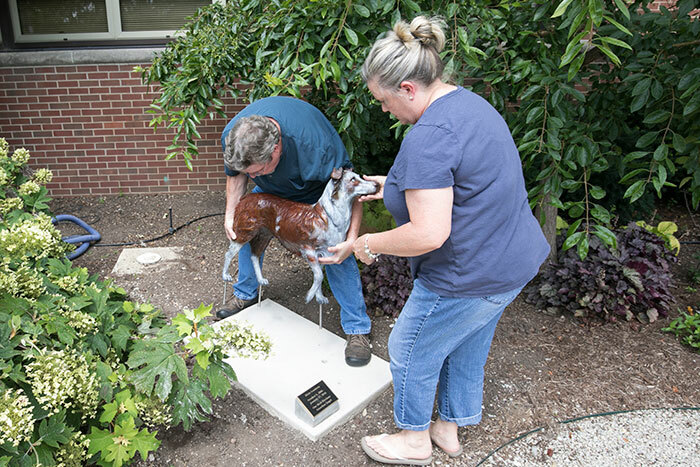 To learn more about the Dolores McCall Pet Tribute Garden and ways to memorialize a pet, please visit the Purdue Veterinary Medicine giving website or call the Advancement Office at (765) 494-6304.